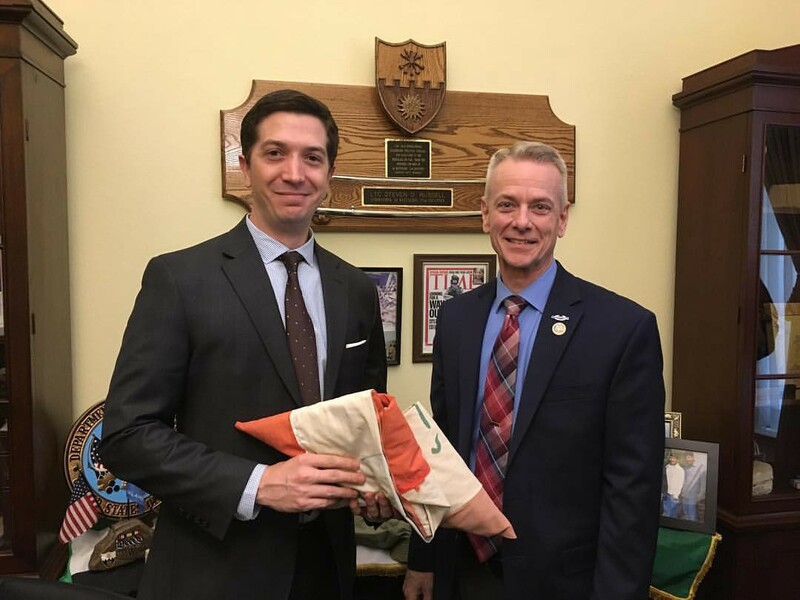 Doug Jackson meeting with Rep. Steve Russell of OK 5th District. With a High Ground Veteran Advocacy(HGVA) fellowship, you get an opportunity to learn from other veterans who know how to effectively navigate D.C. channels and get legislation passed. As a HGVA fellow, I was moved by the time I spent around others who have dedicated often a lifetime of service to this country and it’s values. Though a quick lesson learned was that it’s easy to have a good idea, much harder to see it through. Beyond the practicals of learning how to navigate legislation, you also gain access to a wealth of knowledge from individuals who have made it their life’s mission to serve others. For the most part, I had been using my Twitter account to stay informed on foreign policy and connect with other young veterans who were using their military experience and perspective to make a meaningful change in the world. When High Ground Veteran Advocacy popped on my radar, I was immediately impressed. I thought, “here is a group of young veterans who have the optimism and will to fight what seems a completely uphill battle — seeking upgrades for veterans who had received bad paper discharges.” As I was tracking them I imagined having an opportunity to speak with lawmakers regarding one of the most obvious facets of military life in need of reform — the transition to becoming a civilian again. And HGVA soon gave me that opportunity. We know the military spends months, sometimes years training its service members for war. But most people do not realize the reintegration training for coming home lasts about five days. After an enlistment and often multiples deployments, the military takes very little time to prepare it’s war fighters for returning home as a new person. This lack of training comes with a host of consequences for the veteran community: joblessness, homelessness, substance abuse, etc. Much of this can be linked to having lost a sense of purpose, or not having been given the proper tools to process one’s experience. And so when HGVA announced they would be receiving fellowship applications, I jumped on the opportunity. It almost seemed too good be true and I stalled on the application phase, but Kris Goldsmith(HGVA founder) himself called me, and encouraged me to finish my application. As you have read, I was accepted and recently completed their first fellowship class. Few experiences have humbled and inspired me as much as my time in Washington during the training and execution phase of our fellowship. One of the unfortunate hallmarks of the individual veteran experience can be isolation, not just from civilians but the veteran community at large. But veterans owe it to themselves to not lose hope, to not become disheartened or invisible when they return to society. Fellowships like the one with HGVA give veterans an opportunity to build off of their experiences, to meet others who will take their ideas to heart while challenging them to grow into the next seasons of their lives. HGVA has the will, determination, and connections to help a motivated veteran get their ideas heard.